College: B.A. from U. Texas-El Paso, 1991 (education); M.A. from Texas A&M, 1997 (education). Playing career: Spent four years -- two as a starter -- as an offensive tackle at UTEP. The primary guy is Dirk Koetter, former head coach at Boise State and Arizona State. He now is the Jacksonville Jaguars' offensive coordinator. Other influences include Andy Reid (Philadelphia Eagles head coach) and R.C. Slocomb (former Texas A&M coach). Grimes is about as new-school as it gets. Though he spent a significant portion of his career around Dirk Koetter, one of the most gruff coaches around, Grimes doesn't consider scolding a powerful instructional tool. Much like Curtis Luper, Grimes corrects mistakes by explaining how each mistake affected everything else that occurred during a given play. It's a cerebral approach. There is almost no yelling involved. Grimes believes in verbalization. During practice, you'll hear him talk his way through a drill. He'll explain what he wants to see and why he wants it done that way. After he explains, he'll then backtrack through his instructions and make players answer questions about those instructions. He'll make them speak. He's forceful about the whole endeavor, but it's not an angry thing. Grimes doesn't dawdle. He wants to move briskly through his agenda. He has said that contact is a critical part of his training regimen. Auburn's surprisingly small group of healthy scholarship linemen forced Grimes to curb the number of full-contact drills during the spring. He seemed bothered by that. We'll see how that develops as the Tigers re-build their player supply during the next few years. He values toughness above all. Grimes believes everyone can learn how to think like a useful lineman. Being tough, in his opinion, is a trait that cannot be created from scratch. His goal is to sign tough guys and build on that foundation. Grimes seems open-minded when it comes to techniques. He has taught a variety of different styles during his career, which has kept him from becoming betrothed to either two- or three-point blocking. Many coaches feel strongly about one or the other. Grimes seems fine with both. He has spent most of his career in spread-type offenses. Grimes is a happy guy. If football wasn't part of his life, I could see Grimes as a successful pitch man. He speaks firmly, his voice projects, he has a tidy appearance and you believe what he's saying. More than once, I have passed by Grimes' office to the sound of reggae music. When he's coaching, he's intense. When he's not coaching, Grimes is a calm, introspective guy. He is as dedicated as anyone to building one-on-one relationships with his players. Grimes seems genuinely interested in becoming an important part of their college lives. You don't hear much about it, but Grimes plays an important role in the Tigers' recruiting enterprise. Auburn has a mixture of promoters and realists. Grimes is a promoter along with Trooper Taylor, Curtis Luper and Tommy Thigpen. He can command a room. He can cold-call kids and establish a meaningful relationship with them. He can sell the program without any hint of inhibition. I think he's upwardly mobile, but it's hard to see Grimes as a head coach. He's almost too nice. I don't mean to say he's soft. He's not. It just seems like the altruistic, happy-go-lucky head coach is teetering on the verge of extinction. Maybe that will change. Hey everyone. Auburn assistants Trooper Taylor and Curtis Luper spent some time this afternoon holding a mock press conference for a group of high-school students. The students were allowed to ask about anything that interested them. Some of the questions were mundane. Some were excellent. ``We've been unique and different. We actually used limousines. That was our way, our head coach's way, of emphasizing the state of Alabama. We had to let people know that our coaching staff is here and we'll be out and about. It's unprecedented in college football. Generally, coaches go in different directions. We wanted to saturate the state of Alabama. We accomplished our goal." ``A lot of people make mistakes in thinking it's us versus Alabama. That wasn't the goal. Our goal was to keep other schools from coming into this state and taking the best players. Look at JaMarcus Russell. He left Alabama, went to LSU and they won a national championship. Patrick White leaves and goes to West Virginia. He put them on the map. Our responsibility is that we take care of the state of Alabama. We'll outwork them -- no matter who it is." If I wear my hat backward and walk into Wal-Mart, it's going to be a three-hour trip. It should be a 30-minute trip. My kids remind me of that all the time. At most places, they don't recognize the assistants; it's just the head coach. At Auburn, it's different. "We are developing the culture of our football team. From A to Z. What are they like when they walk across the campus? What are they like when they walk in the building? Will they take their hats off? Will they say `yes sir' and `yes ma'am'? Do they take their earrings off? Will they pull their pants up? Everything. To develop that culture adequately takes a couple years." ``It's been more than a career for me. My father died when I was 12 years old. The men in my life have been coaches. I knew I wanted to coach when I was 13 years old. Those men brought me into their homes, took care of me, treated me like family. The funny thing is -- most of them weren't the same color as me and none of them had the same last name as me. All they ever asked from me was for me to do my very best." ``for the side of the helmet of the Dallas Cowboys." TAYLOR answering this question: "What was your reaction to the recruit who called out Nick Saban during Big Cat Weekend?" ``He's a 17 year old kid. We're not allowed to comment on their exact names and stuff, but he's a 17-year-old kid. We had to help him and make him understand why that was such a significant deal. He doesn't know. You can't be held accountable for something that you don't know. Our job is to teach those guys, once they get here, between right and wrong. It's happened to me before. I wouldn't not have taken it personally. I would have considered the source." I should give a no comment this, but I'll tell you this: I've got to mow my own grass. I can't tell you what's happening at another school. We'll learn from this, too. Even In life, you have to learn from other people's mistakes. I don't know the scenario or situation on how it got to be what it was, but I know we'll make sure we're not in that same scenario. Anytime something happens that may affect our players, we take Cliff's Notes. We have a team meeting and we go over it -- whether it's a player getting arrested at another school or a student who may have gotten hurt with a bad choice. We let them know: This could easily be you." Hey everyone. Perhaps you should peep the short story appearing in today's editions of the Advertiser. It chronicles what Gene Chizik et al. have accomplished with their recruiting effort so far ... and where they're headed from here. SCHEDULE UPDATE: I am doing two fun things at Auburn today. I will be a guest speaker/critiquer at a high-school journalism workshop. The main event, get this, is a mock press conference with Trooper Taylor. I'll try to get some of this recorded either on video or at least on the HABOTN. Should be a hoot. I'm also interviewing Tommy Thigpen this afternoon. 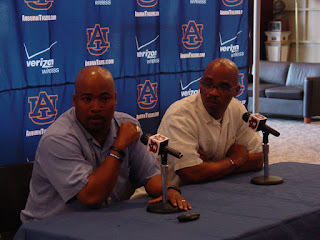 I have several things to ask him about his role in recruiting, his career approach, his mentor and Auburn's safeties. So there was a rumor going around that DB Aairon Savage recently suffered an injury while working out. Coach Gene Chizik took the surprising step of acknowledging that bit of information this afternoon. the extent of the injury is still being evaluated by our medical staff." Auburn has not acknowledged the type of injury involved. He missed the 2008 season with a torn knee ligament. Hey everyone. My little soiree with the Biscuits has ended, so I'm back to reclaim my title as Montgomery's fittest Auburn bloggist. NEW AS OF NOON: LB Jessel Curry of Buford, Ga., has committed to the Tigers. We know this because our friends at AuburnUndercover.com and AUTigers.com say so. He is the seventh player to commit -- and the third linebacker. Scout.com has Curry ranked as a 3-star. Rivals.com hasn't yet assessed him. Our friends at AuburnSports.com reported yesterday that Arkansas TB Michael Dyer (left) had a swell unofficial visit to the Plains last weekend. Lache Seastrunk and Marcus Lattimore get a lot of hype, but Dyer also is a game-changing back with significant interest in the Tigers. I think he'll ultimately be worth watching more than the other two guys because Auburn has an Arkansas specialist (Gus Malzahn) on staff ... whose offensive marketing will sink in with Dyer. 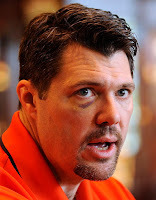 Oh, and Dyer has identified Auburn as his No. 1 team. For now. I've been getting questions about QB Tyrik Rollison lately, which surprises me a tad. Yes, I believe he's going to qualify. Enrolling at Auburn will not make him a candidate to play this fall. The videos I watched -- you probably saw the same stuff -- showed me a versatile player who will need Malzahn to streamline his throwing mechanics. I don't believe Rollison will be a factor at quarterback this season. Neil Caudle and Kodi Burns have a lot of experience ... and a major head start in Applied Malzahnetics. Birmingham LB LaDarius Owens (right) has been making himself visible at Auburn lately. He was part of Big Cat Weekend, then Owens rolled through campus last weekend after visiting his uncle. You old-timers know that uncle as James Owens, Auburn's first black scholarship signee. That was 1969. Now it's LaDarius Owens intriguing the Tigers' coaching staff. The Jess Lanier High linebacker, whose responsibilities often mimic a defensive end's, holds offers from dozens of schools. He has been non-committal about his college plans so far. Hey everyone. I took Saturday off completely, as you know, and did lots of fun things with my peeps. Thanks for still visiting the site and commenting like mad! •I'll soon be headed to Riverwalk Stadium to cover the Biscuits-Lookouts game. Our minor-league baseball ace, A. Stacy Long, is on furlough and he has trusted me to maintain his high level of journalistic dedication. •I haven't heard anything about Auburn during the past few days. A lot of the key people are on vacation (or headed there today), so I expect things to be relatively quiet until after July 4. •I have scheduled an interview with Tommy Thigpen for next week. I'll be writing about Auburn's overall recruiting effort and discussing some of the more innovative ways coaches are connecting with prospects. •I'll continue the coaching snapshots next week. Still remaining: Trooper Taylor, Jeff Grimes, Phillip Lolley.